Venezuela has given an extra $9 million to the film "Toussaint," a co-production between Danny Glover's Louverture Films and Venezuela's film studio Villa del Cine. The government previously donated nearly $18 million toward the $30 million budget of Glover's pet project about Toussaint Louverture, who led an 18th-century uprising in Haiti. Venezuela has been trying to attract more productions to its $13 million Villa del Cine studio. 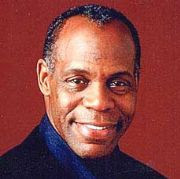 This is a shrewd move by Danny Glover. 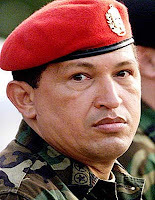 Although we disagree with the politics of dictator-in-waiting Hugo Chavez, right, we do respect Glover's business acumen in securing money to produce this important film. We were critical when Glover, Cornel West, and Harry Belafonte visited with Chavez to criticize America, particularly when Joe Kennedy, of Citizen's Energy Corporation, cut a $100 million advertising and fuel oil deal with Hugo. America does business with distasteful sorts all the time so we guess there is nothing wrong, within that context, with Glover financing "Toussaint" with dictator dollars.